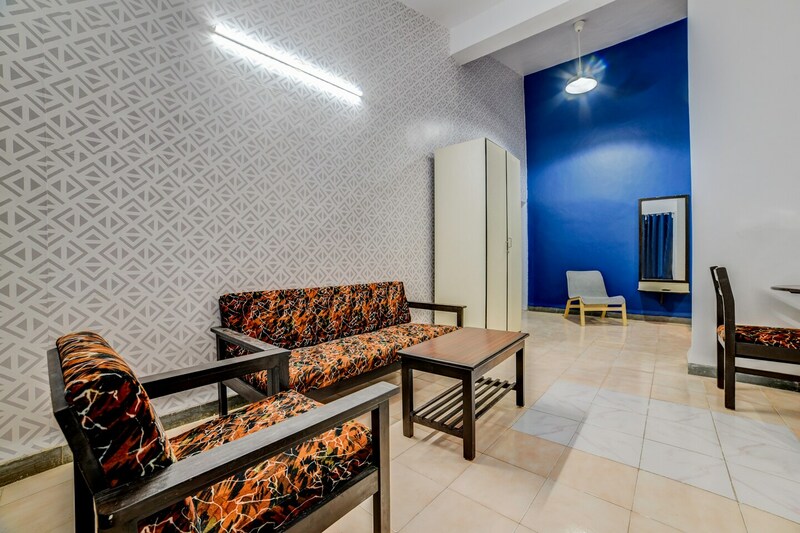 OYO Home 15110 Elegant Studio is a tasteful property with bright and lively interiors, located at a short distance from the Calangute Mall. The Calangute Bus Stand is at a walking distance and the Calangute Beach is a short drive away from this place. Cross Of St. Alex Church, Museum of Goa, and Baga Beach are the nearby tourist attractions. The property has a well-maintained lawn and there is a kitchen on the premises. Both common areas and the bedrooms are done up in bright blue and white. Wallpapers and colourful furniture add to the appeal. The rooms have large windows and come with spacious balconies. The rooms here come with TV, AC and mini fridge. There are geysers in the clean bathrooms. Power backup is provided. The property is surrounded by restaurants like Navtara Veg Restaurant, Udupi Anand Sagar, Punjabi Uncle's Kitchen, Cafe Sussegado and Kenny's - The Breakfast Place.